Members of Zanu PF rally in Mutoko, about 200km east of Harare displaying to President Emmerson Mnangagwa on June 9, 2018 what they want him address if he wins the July 30 Zimbabwe general election. The Zimbabwe Electoral Commission has so far withheld the official voters roll from most parties — a move that has raised concern over the body’s ability to run credible elections next month. The country’s main opposition has said Zimbabwe should not hold the polls if the commission does not show impartiality. Last week, some Zimbabwe opposition parties were unable to register their candidates for the July 30 presidential election. The parties blamed their plight on the Zimbabwe Electoral Commission, saying they did not have the official voters roll from which to find the required 100 signatures of endorsement from registered voters. President Emmerson Mnangagwa is calling for a peaceful election from which he said all Zimbabweans can prosper. In the file photo, on June 9, 2018 he is at a Zanu PF rally in Mutoko, about 200km east of Harare. On Tuesday, the chief election agent of the Movement for Democratic Change Alliance, Jameson Timba, said even though the MDC managed to register, the issue of the voters roll was still problematic. “This is disgusting. This is totally unacceptable, taking into account that a certain government is bragging on Twitter that they were given the roll,” said Timba. That was a reference to the British Embassy in Harare, which said Monday it had received a copy of the voters roll from the commission. 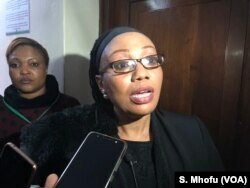 ZEC chairperson Priscilla Chigumba says her organization is working to ensure all 23 presidential candidates and prospective participants in the July 30th election receive the roll. FILE - Priscilla Chigumba, the chairperson of Zimbabwe Election Commission, speaks to reporters in Harare, June 14, 2018. “There is nothing short of an earthquake which can stop the election, so whether candidates scrutinize the voters’ roll, whether they see any anomalies in it, whatever the anomalies are, whatever legal recourse they have, will not stop the election. I want that to be very clear that is the law," said Chigumba. Opposition parties say they also want the roll to check for ghost voters. Timba said there will be no election if the Commission does not answer opposition demands. President Emmerson Mnangagwa, who appointed Chigumba, made a campaign pitch on social media Tuesday. He ended by calling for a peaceful election, from which he said all Zimbabweans can prosper. 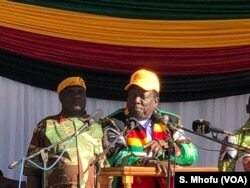 President Emmerson Mnangagwa addresses members of ruling ZANU-PF in Mutoko, June 9, 2018, about 150 km east of Harare. Mnangagwa, who took over after Robert Mugabe resigned under military pressure last November, has vowed to ensure a credible election. But a Harare-based senior researcher for Pretoria's Institute for Security Studies, Derek Matyszak, says the electoral commission's independence remains doubtful. "What should have happened is that the president [Mnangagwa], should have approached the electoral commission and the electoral commission should have said, 'Hold on we are not yet ready," he said. "We do not have a voters roll. Please hold back for a few days.' But because the electoral commission is not independent, it did not want to challenge the president. ... Chaos resulted." Zimbabwe's High Court has ordered the Electoral Commission to furnish the list of voters to the National Constitutional Assembly party, after Zimbabwe Lawyers for Human Rights petitioned the court. Opposition parties have long accused the ruling ZANU-PF party of manipulating the elections commission to ensure victory at the polls.